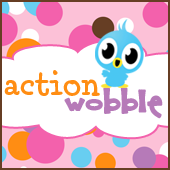 The Action Wobble Design Team is accepting companies that want to get their Wobble on. I'm excited to share my card with you today. I found this card base in the SIL store. It's so cute and has so many possibilities!! This is a brand new stamp set from Sunsational Stamps. I hope you get a giggle from this, I know I did. This is super cute:) Awesome design!